Nut allergies are tricky at the holidays--it seems that nearly every cookie contains some kind of tree nut, not to mention the every present "peanut butter blossom" cookie. That's why it's time once again for my Snowballs recipe, a family favorite I created from my grandmother's recipe that used a large portion of ground pecans. 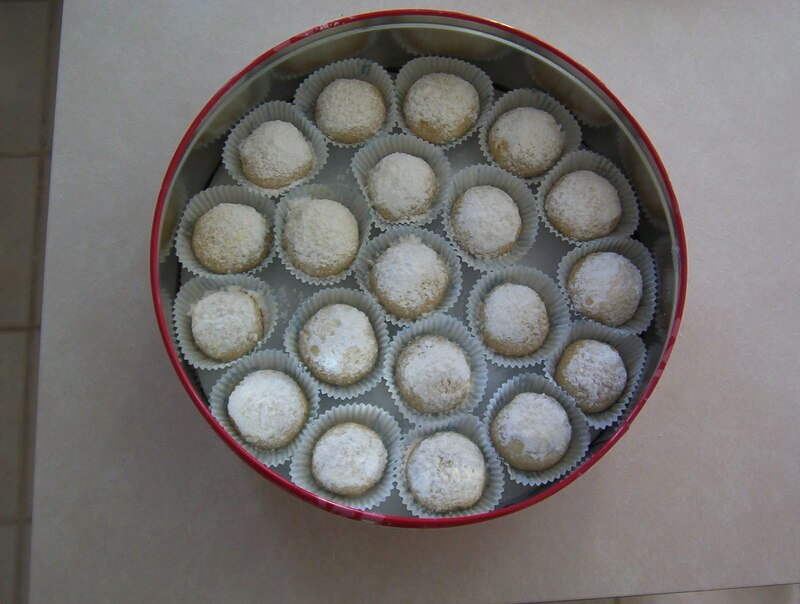 Obviously any recipe containing tree nuts wasn't going to fly in our family, so I scoured my cookbooks until I found something surprisingly similar to snowballs--a Greek cookie called Kourambiethes. Unlike most Greek cookies this version of "kourambiethes" contains NO nuts at all. (Some versions do, of course. Just not this one.) Plus, they have the same shape, taste, delicious flavor and yummy powdered sugar coating that my grandmother's cookies had. This recipe is special to my family because it comes directly from a 1950s Greek church cookbook given to me by my mother-in-law. My husband's grandmother (born in Greece) was one of the contributors of this cookbook, so the grandmother connection continues! For a festive and attractive addition to any holiday celebration, give these a try. Also, keep in mind that the dough for these is not super-sweet--kind of like a shortbread cookie. The sweetness comes from rolling these in powdered sugar when they're hot and then sifting more over them when they are cool. Preheat oven to 350 degrees. Using a standing mixer, beat softened butter until very light and fluffy. Add powdered sugar, egg yolk, vanilla and orange extract if using, beating thoroughly after each addition. Add flour a little at a time until soft dough is formed that can be handled easily. Taking about a teaspoonful at a time, (I use a tiny ice-cream scoop) roll into a small ball. Place on a non-stick cookie sheet and bake for 15-20 minutes. Sprinkle liberally with powdered sugar while still hot. Once cool, sprinkle with plenty of powdered sugar again. Check it out: Chicago Parent magazine decided to include these cookies in their online cookbook. Peanut Allergy News: Cyber Monday Savings from Vermont Nut-Free Chocolates! Vermont Nut Free Chocolates (one of my all-time favorite nut-free chocolate brands) is offering a weekend sale that goes through Cyber Monday!!! Now through Monday, Nov. 29 you will receive 10% off all Vermont Nut Free Chocolates products (excludes shipping, warm weather packaging & gift certificates). Simply use the code: “cyber” (all lowercase) at checkout. This offer applies to all products, including the Christmas selection. You will also find fabulous Hannukah-themed chocolates including nut-free chocolate coins! Christmas selections include Peppermint Bark, festive truffles, and delicious Christmas-themed chocolates, from Vermont Nut Free Chocolates’ vast selection of allergy safe treats. All of these treats make perfect gifts for those with peanut and nut allergies. Use them as stocking stuffers, hostess gifts, Hannukah treats--you name it. If it's festive and it's chocolate, Vermont Nut-Free has it. Get your holiday orders in while this special offer lasts! Peanut-Free, Nut-Free Pumpkin Muffins...for Thanksgiving or the Day After! I always go a little overboard when purchasing canned pumpkin puree since I love to bake with it this time of year and pretty much only this time of year. If any of you are in the same boat, what do you do with your extra canned pumpkin? I've got an easy and delish nut-free recipe you might like to try either for Thanksgiving or anytime afterward. Pumpkin lovers won't be disappointed! I got the idea from the pumpkin muffins at Panera--off-limits to my daughter, of course. So why not make our own? You can also bake this recipe in a loaf pan for a moist and delicious pumpkin loaf cake. Be aware that this recipe uses butter and eggs. If you also deal with dairy allergies, you can use your favorite dairy-free banana bread recipe and swap out the bananas for the pumpkin puree. 1. Preheat oven to 350 degrees. Grease muffin cups or 9-in. x 5-in. loaf pan. In medium bowl combine flour, salt, spices, baking powder and baking soda. In small bowl combine pumpkin puree, milk and vanilla. 2. In a large bowl with mixer at medium speed, beat butter and sugar until light and fluffy. Beat in eggs, one at time. Reduce speed to low; alternately add flour mixture and pumpkin mixture, ending with flour. Scrape the bowl occasionally with a rubber spatula to ensure even mixing. Beat just until blended; do not over beat. 3. Pour batter into prepared muffin tins or loaf pan. For muffin tins, bake for about 20 minutes and then test with toothpick. You don't want to over bake so a few moist crumbs clinging to the toothpick are fine. For loaf pan, bake about 1 hour and then begin checking. Again, do not over bake. 4. Cool in tins or pan and then turn out onto wire rack. Let cool; then sprinkle with confectioner's sugar, if using. Serve warm. I hope everyone's Thanksgiving prep is going well! Stay safe, stay cool and most of all, have a happy Thanksgiving! I ran this recipe last year and it is so good and easy I just had to run it again. Unlike so many of the sweet potato recipes floating around during the holidays, this one has no pecans or walnuts. I like my sweet potatoes "clean tasting" so this is perfect for me besides being safe for many food allergies. And you can make it in your microwave. What could be better? You can even bring this with you if you're not hosting the dinner--just zap in the microwave before meal time. I adapted this recipe from the wonderful cookbook "How to Cook Everything" from Mark Bittman. Combine all ingredients and 2 tablespoons of water in a microwave-safe bowl; cover with a lid or plastic wrap. Microwave on high for 3 minutes, shake the container and continue to microwave at 2-minute intervals until the sweet potatoes are very tender. Serve hot. Told you it was easy. Plus, it frees up much needed oven space! Check back soon for more Thanksgiving recipes and tips! 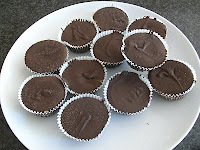 Peanut Allergy News: Thanksgiving Savings from Vermont Nut Free Chocolate!! "From now through Thanksgiving Day Vermont Nut Free is offering 10% off all of our items on our Thanksgiving page. Just enter the promotion code Turkey at check-out to receive your discount. Offer applies only to items on the Thanksgiving page." Click the link for your Vermont Nut Free Thanksgiving coupon. I hope you will take advantage of the sale prices. 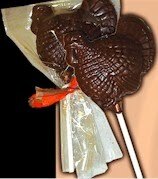 Chocolate turkey pops (pictured above) and solid chocolate turkeys are wonderful little treats to place at the "kids table." They help to raise nut allergy awareness, provide a nut-free treat for the allergic kids AND they are melt-in-your-mouth delicious. On second thought, make sure you get enough for the "adults table" as well! I'll be posting more holiday deals from Vermont Nut Free in coming weeks, so please keep checking back! 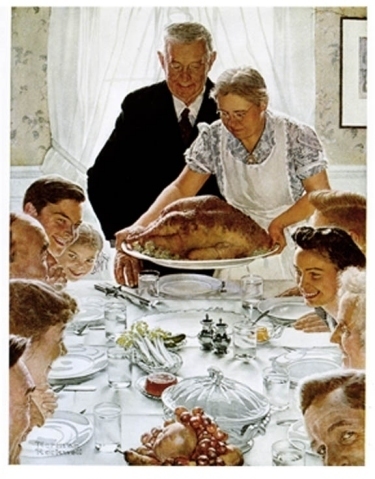 This classic Norman Rockwell painting certainly shows the ideal Thanksgiving meal--everyone anxiously anticipating the feast with a smile and a feeling of goodwill towards all at the table. Obviously, many families don't meet the Rockwell ideal. They struggle with personality clashes, unresolved arguments and other emotional issues that seem to surface at the table along with the Thanksgiving meal. Even more complicated: What if you are the parent of a child with food allergies? Or you have them yourself? If your family is anything less than perfect (and truly, who has perfect relationships with everyone in their family) food allergies present a whole new way for relations to fight. This is not a topic that is covered often and mainly because it is an awkward conversation to have. Too often the food-allergic (and their parents) are meant to feel as if they are taking away from the feast, the fun and the tradition if they ask for a certain food to be eliminated from the menu. This is especially difficult at Thanksgiving because the "traditional meal" is so iconic to everyone's idea about what Thanksgiving "should" be. I've had so many people speak to me about in-laws, grandparents and other extended family members who just refuse to accept food allergies during the holidays. They're determined to serve that pecan pie or walnut-laden turkey stuffing despite the fact that their child, nephew or niece, grandson or granddaughter will be unable to partake of a large portion of the feast. Not only that, the presence of certain foods throughout the kitchen and the home may pose too much of a risk to a highly-allergic person. This is hard. What do you do? First of all, try to remember the reason for Thanksgiving and the fact that you are in the driver's seat with your child's health and of course your own. If you are not getting reasonable accommodation--and by that I mean, a main course safe for your child or at least an effort to lessen food allergy reaction risks--then you may have to say "We can't make it this year." Will this anger some family members? Probably, but that's really not your problem. Your problem is health. That's not to say that you close yourself off, shut down the communication and refuse to accept anything less than a full conformity to your rules. Compromise is key here. One of the first things to consider is that the family members in question may not understand the very real danger of food allergies and that a severe reaction may cause death. When you live with this every day, it's hard to imagine someone won't get this but of course, many don't "get" it. Educate them. Show them this blog, the FAAN site and any information you doctor has given you. Share the details of your child's allergic reaction, if they've had one. Explain what can happen if an allergic person eats a certain food. Explain cross-contact. I talk more about how to do this here. You won't be able to make inroads with everyone and in this way, you may also need to accept a less than "perfect" Thanksgiving. Family ties are important and so is health. You shouldn't have to choose between the two, but there are times that you will have to make that choice. Even if you find yourself opting out of a feast this year or part of a feast, consider hosting your family in the future, where you will control the food. Try to keep family in the fold, because this is really what Thanksgiving is all about. Not pecan pie. Not pumpkin walnut bread pudding or pine nut bread stuffing. Also, Allergic Living magazine will be featuring the topic of family feuds and food allergies at the holidays in their upcoming Winter issue. Stay tuned to their web site for details--today is the last day to subscribe in order to receive the Winter 2011 issue, so head over there! I'm a subscriber and it's a such a wonderful resource. If you have Thanksgiving tales to share, good or bad, we'd love to hear them. Check out this photo of a label from Breton Multigrain Crackers. From my perspective as a consumer looking to avoid even traces of peanuts or tree nuts, the label I share in the photo should be one of the "good ones." It is clearly marked with regard to any nut ingredients and clearly states that the product is made in a nut-free facility. Does a label that states clear nut allergy info boost my interest in buying the product? Absolutely. However, take another look at the label. This particular flavor also includes sesame seeds and an allergy to sesame is on the rise, so this ingredient may be a concern to some of you reading this right now. Before we get too angry at the company, though, a quick note: sesame is not one of the "Top 8" allergens and the allergy warning in bold type on this package is totally voluntary. They didn't have to put it there, but they did. I'm talking labels because soon those of us in the U.S. will be talking turkey--as in Thanksgiving and many of us are going to be eating at the homes of family and friends. Label reading is crazier than ever these days and food labels with regard to allergy warnings are changing like the leaves in autumn. Consider the new labels for Ragu spaghetti sauce. Now, any time of year people are serving spaghetti and tomato sauce. I make my own--taste preference as well allergy concerns factor into this decision--so I'm not a regular Ragu customer. Howevever, I came across a troubling label discussion on the page of one of my food allergy Facebook friends. Turns out Ragu has changed some of their sauce labels to reflect nut allergy warnings due to new manufacturing lines/locations. Hi Jenny! We totally understand your concern about nuts in our sauce. As of 2/10, some labels of our Traditional sauce stated that the product may contain tree nuts. This is because a little amount of this sauce was produced at a different plant, thus there will be an "L" in the date code instead of a "Y" so if you want to be extra cautious, check the date code. An example of a date code would look like this: JAN2211YU010302A1. We do NOT put nuts to our Old World Style Traditional - we had to put that different label # on there just for precautionary reasons. We regularly test for allergens at that facility to ensure our products meet the highest standards quality regardless of production – and to date, no allergens have been found. As we’re sure you know, you can never be too safe – so you can stick with any date code that contains a “Y”. Thank you for your concern and we hope this information is helpful! I know. I'm a little confused after reading that as well. However, that's all I know--if you want more info from Ragu, please ask them directly. Additionally, the law that requires the "Top 8" allergens (egg, milk, soy, tree nut, peanut, shellfish, fish and wheat) to be listed on a food label doesn't cover other allergens and does not require any additional allergy warnings in bold type. Allergy alerts in bold type are totally voluntary under current U.S. law. Only the ingredients need to be listed in "plain English." If you have any questions, I encourage you to do your homework (as I do) and contact the companies directly. The more noise they hear, the better chance they may actually create a label that's easy to decipher as well as (fingers crossed, always!!) accurate. The bottom line is to always, ALWAYS read food labels and inspect them before serving to an allergic person. You also want to start alerting your family now if you notice any changes in food labels you've used safely in the past. Any other food label issues you'd like to sound off on? Readers, let's hear it. If possible, share the outcomes of any e-mails you've sent or phone calls you've made. I've been dealing with food allergies and play dates for a long time now and I have to say the awareness has grown with regards to parents and other kids. Food seems to be a big part of play dates (is it me or are we feeding kids ALL the time--school, especially seems more food-centric than when I was a kid) so often this topic comes up for us. "What is "safe" to eat?" is one of the most frequent questions I get and I'm guessing it's the same for all of you. Usually I either OK foods beforehand by physically inspecting the labels or my daughter just brings her own snack or treat. Today, I encountered another aspect of food allergies and play dates and that is how to walk a fine line between awareness and fear on the part of your child's hosts. For example, my daughter got an invite from one of her good friends this morning but her buddy was worried about the food being served. I don't think it's the case with this friend, but I wondered if worries about food had prevented others from inviting my child to play dates or parties. It's probably happened. After all, parents are busy and preoccupied to begin with. If they don't understand that food allergies are manageable provided (relatively simple) precautions are taken, they may want to avoid a child with this condition for fear of making them ill. I get this, but it doesn't have to be this way. I want others to be concerned about food allergies, but not paralyzed by fear. It's hard to get a happy medium when you send your food-allergic child to someone else's home: either they seem way too relaxed or so freaked out that you feel uncomfortable for everyone concerned. The way to combat either extreme is education. I realized that I need to do a better job of communicating with other parents about my daughter. A frank and honest discussion about risks and things to avoid is needed, but so is a reassurance that it will be OK if precautions are taken. I've always done this initially, but I realized that others may need some follow up reassurance. After all, food allergies are serious, and the more others hear about them in the news, the more the come up on people's radar. We need to keep the discussion ongoing. Is it a big deal if my daughter brings a treat to share in case it's needed? Not at all, and that's another solution. Send some food with your child each time they visit a friend and then the other family doesn't bear the burden. They will appreciate it, believe me. Even better--does every social interaction require your child to eat? Not really. Obviously food is a big part of social interaction and that's why I recommend that your child brings a treat if they like. But frankly, with childhood obesity on the rise, everyone is eating too much anyway. Focusing on fun and not always food is a good option and one that I try to emphasize. As I told my daughter's friend on the phone, "She will be happy to spend time with you, that's the important thing." How do you cope with this problem? What works for you or what are you willing to try? Let us know. Food Allergies, Cross-Contact and "Top Chef Desserts"
Yep, Top Chef is in my sights again, but this time as a lesson about cross-contact and how little it seems to be understood by not only the general public but by chefs. Did any of you see last week's "Top Chef Desserts" episode? It was "Restaurant Wars" (in this case, Bakery Wars) in which the cheftestants created a makeshift bakery for one day and then competed with their dishes. Obviously, there were peanuts and tree nuts galore in these dishes. However, at one point, a "customer" came in and said he was allergic to nuts. One of the pastry chefs then said he would make a "safe" treat for this customer and served him one. Now, they didn't show what precautions they took, if any, but with all the peanuts and tree nuts swirling around the kitchen, they should not have served this customer. Not if he had a true nut allergy. The cross-contact risk is too high and the cheftestants were under an extreme time limit. Cross-contact is simultaneously one of the most important and most difficult aspects of food allergies to explain to others. People will say "You can have this--it doesn't have nuts in it." How many times have you heard this? I know I've heard it more times than I can count and so has my daughter. Being responsible about a severe food allergy is about more than ingredients. The environment in which food is prepared is just as important. So is the placement of the items once baked. Take a "nut-free" cookie baked in a "nut-free" facility and then put it on a bakery display next to hazelnut cake and peanut butter cups. Now the "nut-free" cookie is unsafe due to possible cross-contact. Bake a plain vanilla cake in a small kitchen that just featured a peanut butter cupcake. 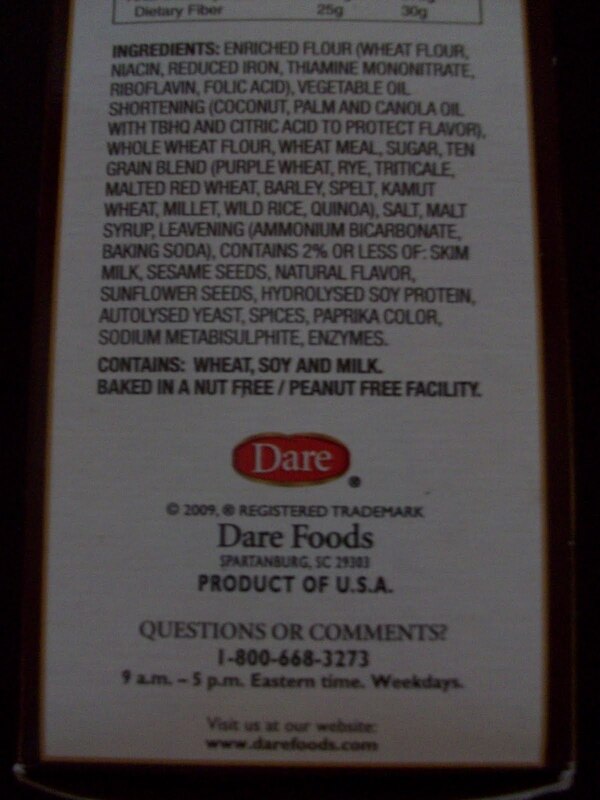 The plain vanilla cake may be harboring peanut matter and is not "safe" for those with a nut allergy. Take a plain Butterball turkey and stuff it with cornbread pecan stuffing and that plain turkey is now unsafe for someone with a nut allergy. Thanksgiving is a whole other can of worms that I will address in future posts. But since so many of us will be explaining cross-contact in the coming weeks, I couldn't resist throwing it in here now. 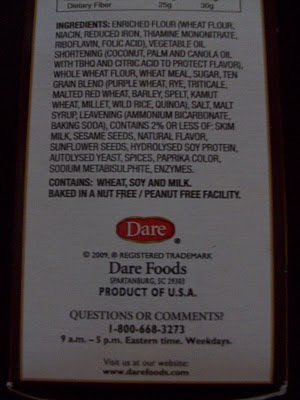 Cross-contact is the reason for food labels that say "may contain peanuts." It's the reason for companies choosing to create and label foods "made in a nut-free facility." Cross-contact is real and not to be downplayed. I've heard Chef Ming Tsai talk about his food allergy-friendly restaurant Blue Ginger and how he tells his chefs to treat any food allergens like they are "raw chicken." When dealing with raw chicken you change cutting boards and utensils and wash your hands frequently or risk salmonella. I think the Raw Chicken Analogy is as good as any I've ever heard. Feel free to use it. The main thing about cross-contact is that if you live with a severe food allergy or care for someone who does, you can't let others lack of understanding about it get in the way of safety. I know people can get offended if you tell them that you or your child can't partake of their particular foods that "don't have nuts in it." Think of raw chicken. And then skip the food in question with a thank you and a smile.